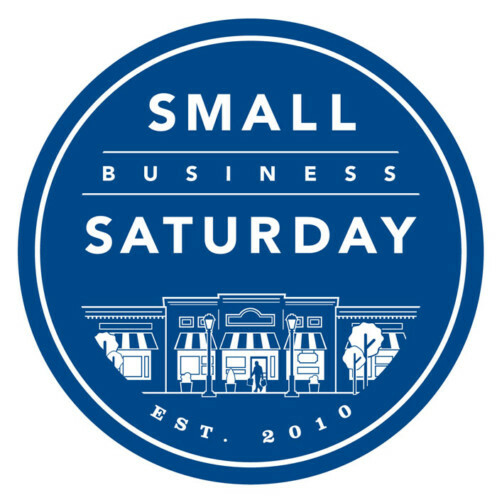 If you patronize a small business, know someone who owns one, or own one yourself, you were also in a tizzy a few days ago scrambling for votes on the missionsmallbusiness.com website. in a nutshell, Chase and Living Social are giving away $3 million in the form of 12 $250,000 grants for small businesses. I found the link through Pat Rothfuss and immediately passed it on to my sister, who has been struggling to keep her beautiful jewelry shop, Dixie Dunbar Studio, alive since Charleston spruced up King Street and the economy immediately went to the dogs. Soteria had to fill out an extensive application that included an essay portion (no, I did not help her with it aside from toss a few ideas her way–she’s a fabulous writer all on her own). In addition, as part of the application process, businesses had to acquire 250 votes on the Mission: Small Business website. I bugged you all for two days solid, and I won’t apologize. I would do anything for my little sister, including pester the crap out of your for 48 hours. And you know what? IT WORKED. THANK YOU ALL FROM THE BOTTOM OF MY PRINCESSY HEART!!!! During this process, Soteria decided that her friends & fans needed some incentive to click a button, so she announced that if she got to 250, she would be posting a video of herself singing Sir Mix-a-Lot’s “Baby Got Back.” and posting it on Facebook for the world to see. As the day went along she got two back-up singers (one is her fabulous husband, who just passed his Nursing Boards) and she started planning set design, costumes, and choreography. I will be posting/embedding the video the moment Miss Stir-a-Bit goes live — so if you don’t catch it on the Dixie Dunbar FB Fan Page, you will catch it here. I don’t know about you, but I CAN’T WAIT. It will be worth it, though. YOU are worth it. You deserve all the smiles in the world for helping accomplish this, and once again, we thank you. Jason Calacanis, co-founder of Weblogs, Inc.
We will keep you posted on that as well. Launching the Dixie Dunbar Studio Fairy Tale line of jewelry is the “Sunday” necklace, inspired by the novel Enchanted. The necklace is made of simple chain, as befits a Woodcutter’s daughter, but the asymmetrical design is pure elegance. Like Sunday Woodcutter’s magical dress of silver and gold the third night of the prince’s ball, the Sunday necklace is comprised of silver- and gold-brass chains that sweep around the neck and culminate in a graceful central waterfall. 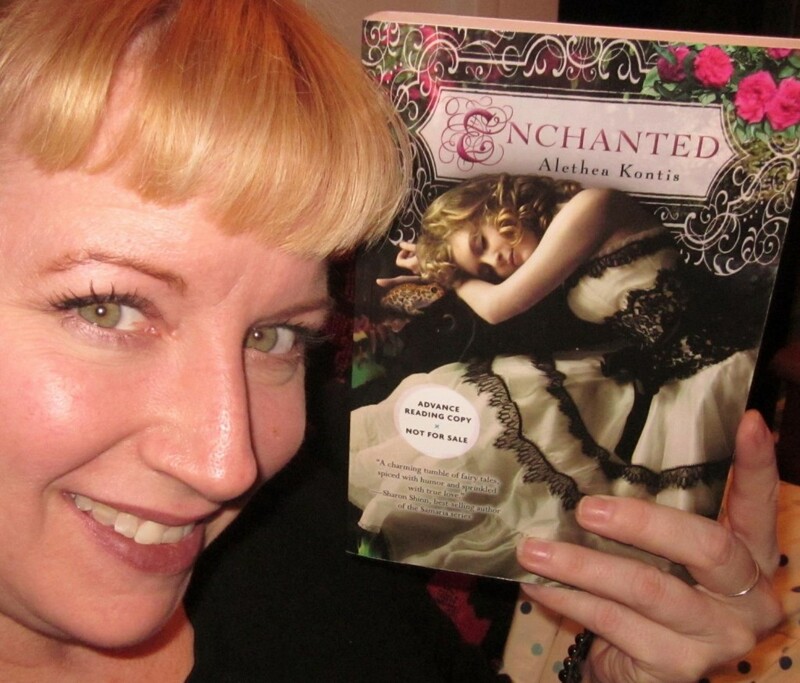 It’s the time you’ve all been waiting for the May ENCHANTED Giveaway is here! 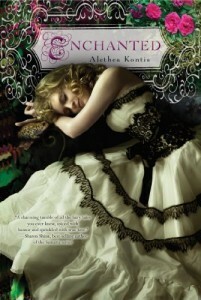 Alethea gave away one signed ARC of her YA debut fairy tale novel ENCHANTED in January, February, March, and April. Now it’s May–official book release time! Come one, come all — the more the merrier! Most importantly, keep reading and sharing the magic! If you’re interested in seeing this bracelet in person, I will be wearing one just like it on tour this summer. Stop by and I will model for you! Giveaway ends May 31, 2012. This gorgeous necklace Soteria and I are raffling off contains faceted chunks of light and dark Amethyst with sterling baby chains, complete with sterling clasp and extendable chain. 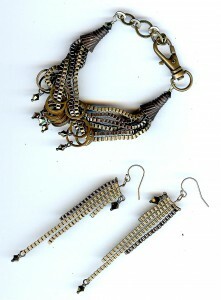 Measures from 16 1/2-19 inches on your neck (more chain can be added if necessary). Want to win it? Click here and Chip In a couple of bucks! [Edited again to add: Now that Paypal is fixed, Chip In seems to be broken, and the widget with the button for donating money has vanished. You can always contribute to the fund straight to me through PayPal. My address is my email: akontis at gmail dot com. Yesterday morning, on the way home from the gym, my sister called to tell me she had emailed me the picture of the necklace she will be donating on behalf of Dixie Dunbar’s Studio for the “Chip In for Gas on Alethea’s Summer Book Tour” raffle. By the time I got home to check my mail there was another email, informing me that Paypal had “temporarily restricted” my account pending a series of verifications, password changes, and proofs of ID. I’ve heard horror stories about this sort of thing in the past. I won’t lie: I was worried. I asked that no one contribute any more to the fund for the time being, and told Soteria that I would postpone posting the picture of the necklace until the issue was resolved. Happily, late yesterday afternoon, the issue was resolved. We will speak no more of this. We will, however, speak of this absolutely gorgeous necklace. 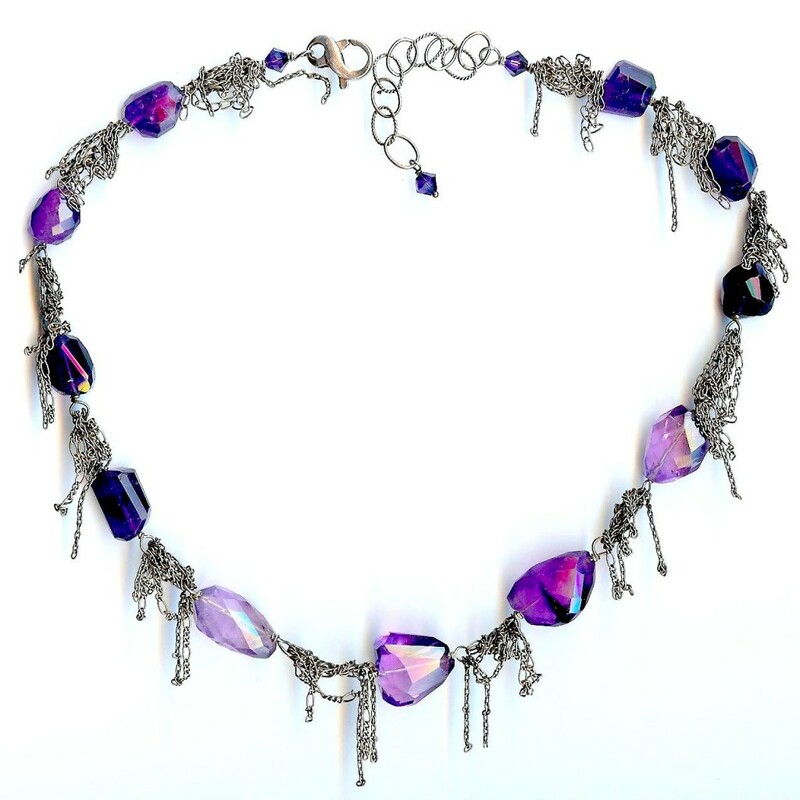 You can win this fabulous, unique, one-of-a-kind, handcrafted, purple necklace for as little as $1. 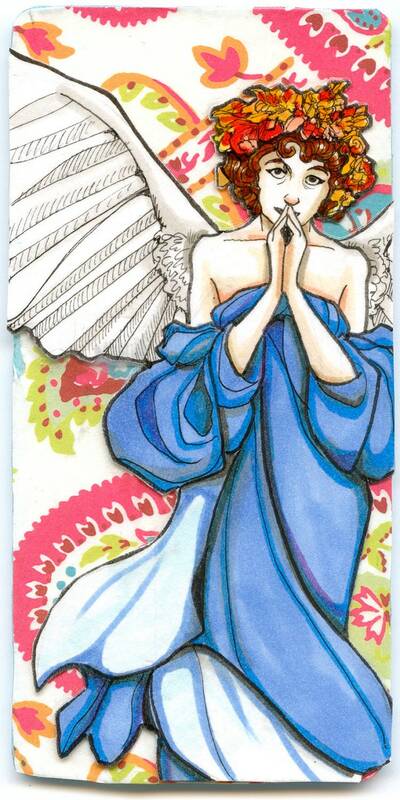 That’s right, any amount, no matter how small, will get you entered to win this fantastic piece of artwork. All you have to do is pop on by and Chip In a buck or two for gas money for my book tour through the Southern US this summer. That’s it! It’s just that easy! Again, I thank you all so much in advance for whatever you are able to contribute. Believe me–right now I am possibly more aware than I ever have been before of just how much every little bit helps. I love this day and age when you can wish for something AND IT ALREADY EXISTS. Why, just the other day, I was wishing there was a place like Kickstarter where I could set up a page and ask my friends if they’d like to help chip in for gas money on my Book Tour this summer. I estimate that gas will be about $500 for the trip. If this fund goes over $500, I will use the money to buy EVEN MORE SWAG to give away at my booksignings. 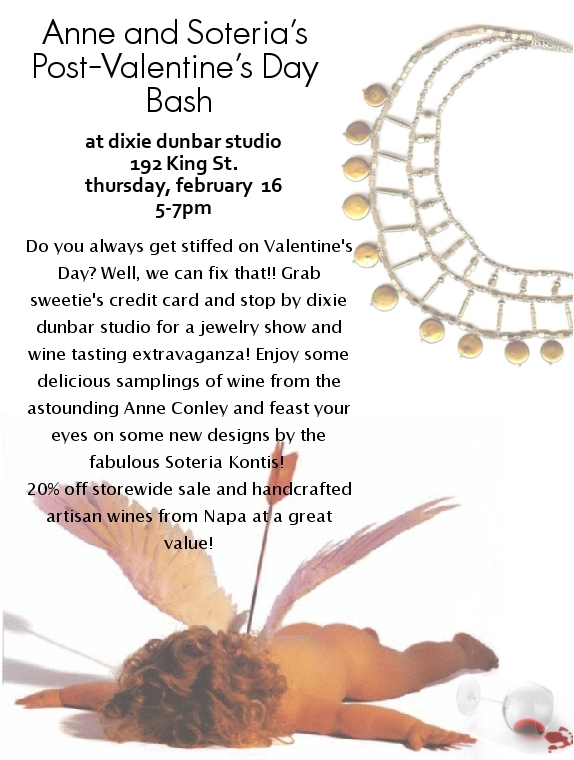 Soteria has also sweetened the pot this morning — anyone who Chips In a bit of cash — even if it’s only a couple of bucks — will be entered to win an original necklace from Dixie Dunbar Studio. So what are you waiting for? Throw a few bucks in the tip jar. And I’LL SEE YOU THIS SUMMER! !